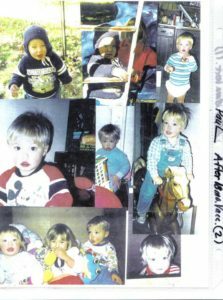 Autism Yesterday: A short documentary about vaccine-induced autism and recovery; interviews of the parents and video clips of their children. Hear This Well Channel on youtube contains over 260 personal videos from parents of children who regressed into autism. Note that there are hundreds of other videos that did not get categorized correctly under the channel, but can be found as well by searching “hear this well.” They also have a facebook group here. This paper cites 4 case studies of older children regressing into autism from illnesses (the cases are not vaccine related but do mimic what we are seeing from vaccines). The producers of Vaxxed: From Cover-Up to Catastrophe spent the summer of 2016 touring the nation and recording video, story-after-story of vaccine injury in every city, and posting these interviews to their Vaxxed facebook page. Man in his 20s talk about his reaction to vaccines at age 11. 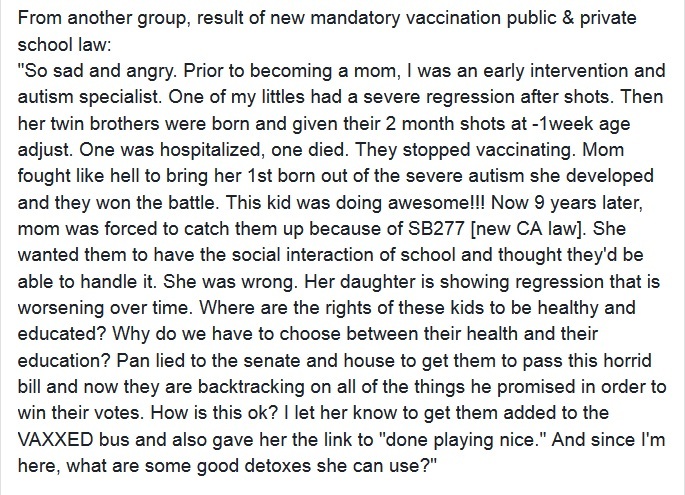 Two distict regressions into autism spectrum disorder, at 9 and again at 18 months of age (Vaxxed video). Delayed MMR, regressive autism (severe) after MMR given after age 2. 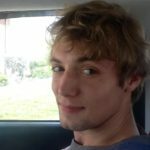 Infant dies a few hours after 6 month vaccinations. “I am the mother of a set of twins, a boy and a girl. 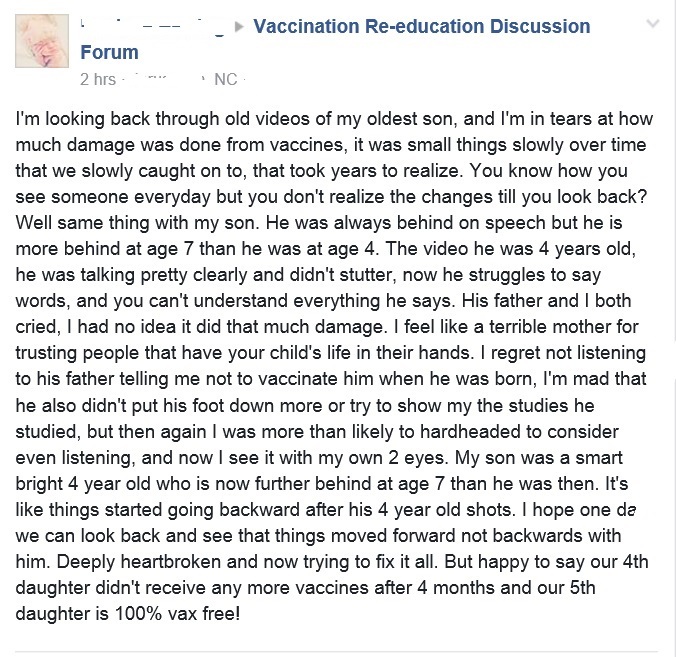 My son was vaccine injured (click here for the Vaxxed video), though my daughter showed no significant reactions and is not autistic. He was born with apgar scores of 9 and 10, in 1991. Beginning his first year he suffered from encephalititic scream, brain swelling and inflammation resulting from DTP vaccine. I found out later the batch he received is what is called a “hot lot,” and resulted in multiple deaths of other children. I discovered there were two hot lots. 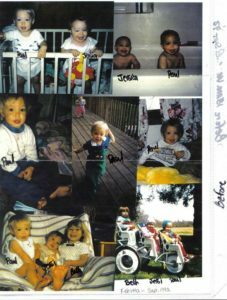 On September 9, 1992, at 18 months old, received MMR, DTP, Hib, and Polio vaccinations. He screamed and thrashed around violently, arching his back so that only his head and his heels touched the floor. At 18 months they received MMR, DTP, HIB, POLIO. . At age 3, he received a single Tetanus shot (Td) and lost what speech he had left. My daughter suffered two regressions into autism. On a delayed vaccine schedule based on the Dr. Sears recommendations, though vaccines were further apart. At least since her 6 month dtap was given at 9 months of age, we were able to notice the changes, such as loss of speech. She had 8-10 words at the time such as “mama” and “baba,” but after that DTaP Combo (DTaP-PC-Hib) she was down to about four. Had we given her that shot on-time, she would’ve been pre-verbal and we may never have noticed the loss of speech, just the delay. The first signs were lethargy and on the 3rd evening, she screamed for 4 hours inconsolably. We now know this is called “the dtap scream.” She broke out in eczema, sudden food allergies to foods she’d been eating before that shot without an issue. She began showing the first signs of sensory processing disorder (she wouldn’t let us touch her head or brush her hair anymore), loss of eye contact, and a complete plateau in development. She never even went through the stranger anxiety phase. The pediatrician told us eczema had no cause but was nothing to worry about, and she said “loss of language is normal while a child is working on other things, like walking.” We were stunned at her response. She didn’t walk for 6 more months, and it wasn’t until about 17 months of age that she was back on-target with language. We stopped all vaccines after that but with a new baby on the way I was scared so got her another DTaP at 18 months. She began showing signs of ADHD, having meltdowns, and sensory processing disorder became more severe. The remaining eye contact was lost, she stopped smiling as much, and naps stopped. For a while “naptime” would be her having a meltdown, crying, screaming and flailing until she passed out from shear exhaustion with sweat and tears in her eyes. At the time we didn’t know what was triggering her meltdowns. (We now know that she can’t handle furniture moved. Ever. For any reason. Not even rearranging shelves or changing bed sheets.) She missed milestones. She didn’t talk back to her favorite shows like when Dora would ask how to get to Crocodile Island, she stared blankly. She didn’t play pretend with her stuffed animals or attach to her things or cuddle stuffed animals. She missed all those milestones. At nearly 3 years of age, we saw a new pediatrician we expected would take us seriously. Our daughter cowered under the chair in fear, as we were informed that she probably had aspbergers syndrome (now called high-functioning autism). That’s the moment everything clicked.